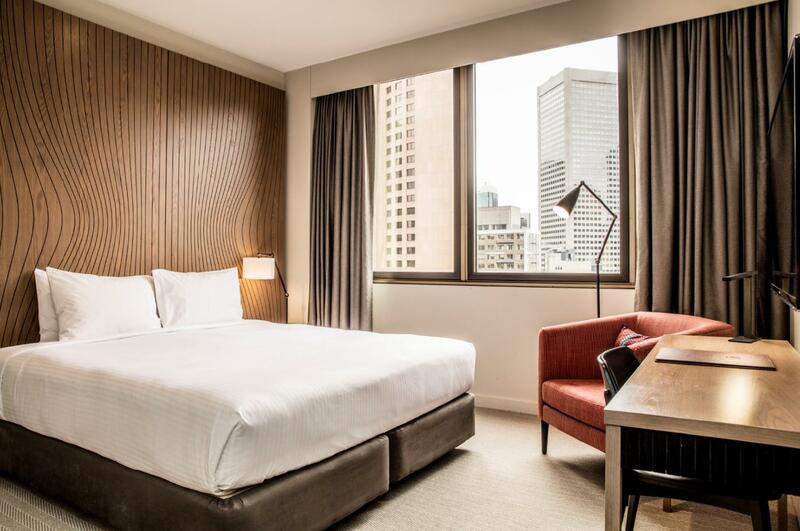 الخيار الأفضل للحصول على المتعة والاسترخاء، DoubleTree by Hilton Hotel Melbourne -Flinders Str يقع في منطقة رائجة من أفضل مناطق المدينة. يسهل الوصول إلى هذا الفندق ذو 4.5 نجوم من المطار، فهو يبعد عنه مسافة 25 km فقط. يوجد العديد من المعالم السياحية الأكثر جذبًا للسياح في هذه المنطقة. 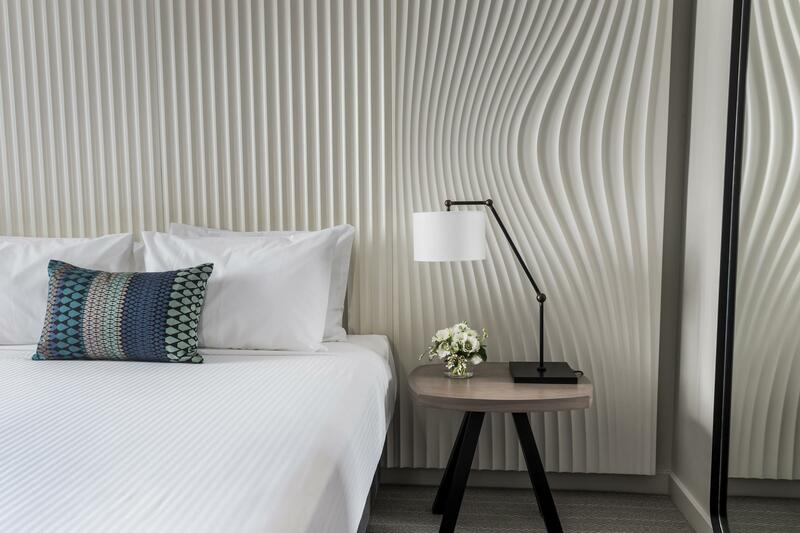 يقدم DoubleTree by Hilton Hotel Melbourne -Flinders Str خدمات لا غبار عليها وكل أشكال اللياقة وحسن الضيافة اللازمة لإسعاد ضيوفه. يمكن للنزلاء الاستمتاع بالميزات التالية: خدمة الغرف على مدار الساعة, مكتب الاستقبال على مدار الساعة, مرافق مخصصة لذوي الاحتياجات الخاصة, تسجيل وصول/خروج سريع, تخزين الأمتعة أثناء إقامتهم في هذا المكان الرائع. تعكس غرف الفندق البالغ عددها 179 المنتشرة في 13 طوابق جواً من الدفء والألفة.خدمات عصرية مثل تلفزيون بشاشة مسطحة, سجاد, رف للملابس, قهوة فورية مجانية, شاي مجاني موجودة في بعض الغرف المختارة. يقدم الفندق مجموعة رائعة من الخدمات كمثل مركز للياقة البدنية، لجعل إقامتك تجربة لا تنسى. إن DoubleTree by Hilton Hotel Melbourne -Flinders Str هو خيار ذكي بالنسبة للمسافرين، فهو يوفر إقامة هادئة ومناسبة للاسترخاء. The location is perfect, front desk staff is super helpful and friendly. The only bad thing we encountered was the room cleaner took our key card and our neck rest without our permission and it went missing. Until now i still don’t have an answer about this. The location of the hotel is fantastic, along Flinders St, and two supermarkets conveniently located just below the hotel. Lots of food outlets nearby and travelling is easy with the tram stops just around the corner. It’s my first time in Aussie, and I, my wife and son are accompanying my daughter on the first weeks in college. The receptionist staff (Angel) is so nice and welcoming us. This hotel is adjacent to my daughter’s apartment, surrounded with several restos, cafes & attractive spots where we visited. Pretty sure we will back to this hotel on the next trip visiting my daughter. Being a well known 4 star hotel, I would expect Doubletree by Hilton to keep up with it's standards however a basic need such as complimentary bottled water and complimentary wifi was not even provided during my stay. Even a 3 star hotel in other countries provides complimentary bottled water and toothbrush. When I called room service to ask about this, I was told we need to pay AUD 1.40 per bottled water. It is not expensive, but as a 4 star hotel, if even basic service you need to charge, i feel that it is ridiculous. Room was clean and nice, however we were allocated room with no windows, which was not stated in my booking, if i had known this, I will definitely book a different hotel. I checked out a night earlier because i was very disappointed with the whole situation. And being my first time ever trying doubletree by hilton, I will certainly not return to this hotel again on my next visit to Melbourne when other hotel provides complimentary wifi. Location : great Value for money : not worth it. Because with same price or slightly cheaper we could have stayed at a 5 star hotel nearby. The single beds are really small, I think it’s max 90cm ! Definitely far from satisfying. And I was kicking myself for paying more than $300 for 2 tiny single beds in a small room. It’s in the heart of city and easy access to anyplace in town by tram & convenient store just next door the hotel. 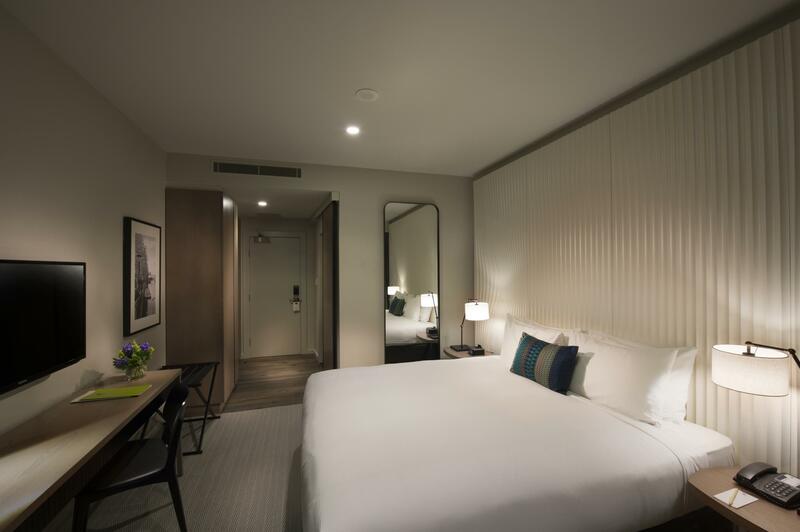 The hotel location is perfect as it is just opposite to train station and walking distance to all major places, like Southbank, CBD, Victoria Market ,etc. Although the size of hotel is small but it is well designed and make you feel comfortable. I am grateful for the integrity of hotel housekeeper and staffs . I only realised that I have lost my iPad in Melbourne somewhere when I reached Melbourne airport .After return to Singapore. I rang up the hotel to check if they have found my iPad in the room , they said YES . I was so happy and felt that the hotel housekeeper and staffs are so honest and helpful. They agree to ship the iPad back to me although I have to bear some shipment cost . I am grateful for their sincerity , honesty & integrity. I would like to say thank you to Hayden Dicken who is in charge for this matter in that hotel . He is professional and helpful . I also want to say Big THANKS to the housekeeper who had found my iPad in the hotel room. The hotel is located right in the CBD. Can easily access the free tram all over the CBD from the stop in front of the hotel. Walking distance to all the pubs and restaurants and just five minutes from the Crown Casino. Shopping in Bourke Street is nearby too. Cool chic bathroom design. Very good breakfast spread. All staffs were helpful in directions and hosting. It's located right next to the Flinders Street Station and within walking distance to St Paul's Catherine, Chinatown and Victoria State Library. It's on the free tram zone too. Staff was helpful and room was clean although a bit small. Good for a short stay, for business or family. The staff were for the most part friendly and courteous, though when we were waiting to check in one staff member ignored us and continued to look at his screen for minutes before even greeting us. It would be good if they could acknowledge us and say that they would be right with us shortly. 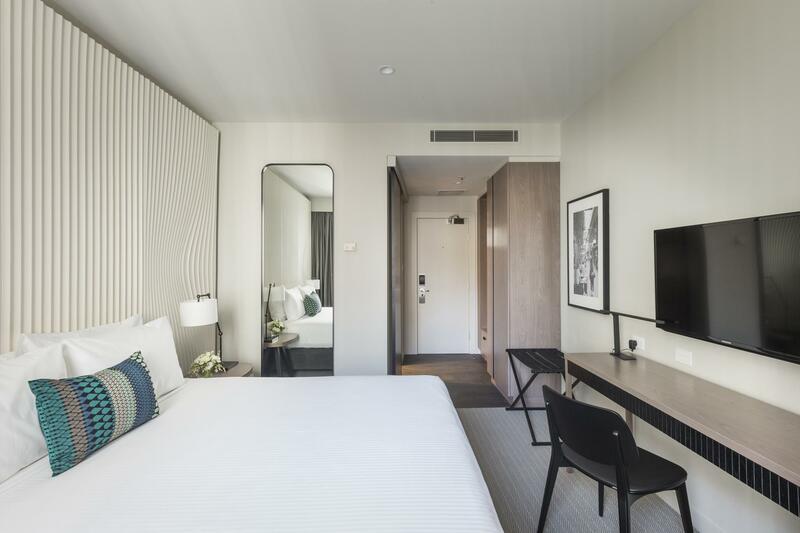 My experience at DT by Hilton Melb was excellent, the location is excellent (ACMI/ Fed Square/ Flinders Street Station all right across the road), with the room itself top-notch and very comfortable. The usual cookie while checking in is always pleasant. Bed was comfy, hot shower excellent, wifi is chargeable so did not take up this option. Design of the room was brilliant, especially in the bath where the tiling works were brilliant. There was a bit of lack of housekeeping on the WC which is nevertheless negligible. Parking can be a nightmare in Melb CBD especially if you reach on a weekday (and expensive!) so plan in advance with regards to parking before you head to the hotel. Location in the middle of Melbourne is a real boost. Walking convenience to almost anything and everything. If not there is the free tram within a certain area. Fabulous views if u get assigned 13th floor and up but you pay for it. Room that I stayed in did not have much space for working as the TV occupied most of the desk. Make sure you know what your final bill is, especially additional charges like late check out. Overall a fairly decent stay. Would recommend. Very friendly and accommodative staff that attended to all our questions. Rooms were clean and comfy for a 4 night stay. Location was extremely startegic, with all the malls and attractions around the hotel. Acces to free trams were a bonus, seeing there was a tram stop and Flinders Station right across. Thumbs up to DoubleTree Hilton Flinders Street. Right on Flinders St, opposite the famous station. Daiso and Fitness First next door, Woolies a couple doors down, Coles around the corner. Access to free tram zone. Requested late checkout - no problems! The hotel was good in terms of location, price and cleancliness. I would highly recommend to everyone to go to Melbourne and stay for a short period of time. The location is exceptionally central, easily access to shopping, food and amenities. The room was good with a renovated bathroom and clean towels as well as bed sheet. It is worth every dollar I spent. 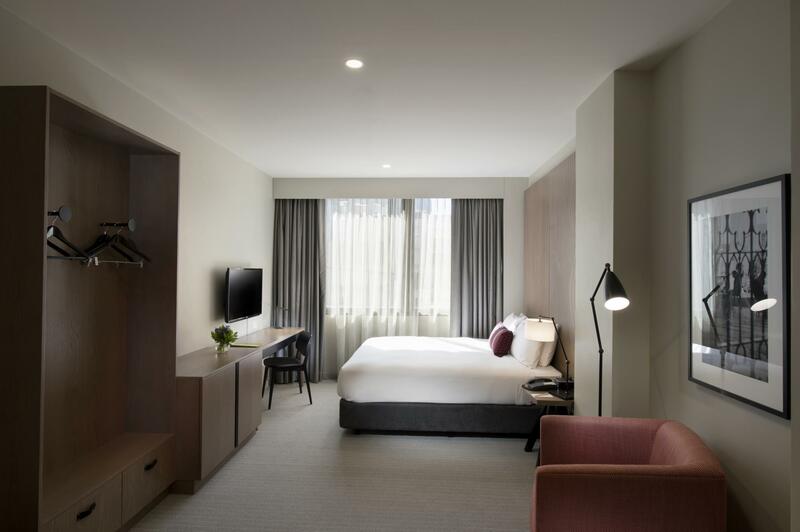 We loved this hotel, its really clean and modern and in an excellent spot opposite flinders st.cstation and easy walking distance to all of melbourne's attractions, such as the NGV, Southbank and Fed Square. Also you get a complimentary warm cookie on arrival so whats not to love! The only slightly negative is the tiny basin in the bathroom with no room to put your toiletries which is a pet hate of mine. We would definitely stay here again. Good location. Near eateries. Easy transport by train/taxi. The check in was efficiently done. Was in my room in less than 5 minutes. Clean and comfortable bed and linens. A small problem was immediately resolved by front office staff who showed initiative to get things done. Small things like cotton buds, bottled drinking water were not available in the room which are standard in most hotels. Better sound proofing needed for the room as outside noise intruded room at night.